2017 Motorino XMb. Picture credits - Motorino. Submit more pictures. The first time you look at this bike, your reaction probably will be: �This is electric��... No way!! !� The Motorino XMb looks like a motorbike used as a prop in the Indiana Jones movies or like a WW II combat bike. And when you knock on its gas tank, you understand that the XMb is not an illusion. Comments: Charging time 7.5hrs with various options. 72V 20A-h sealed lead-acid main battery. Optional 72V 26A-h Lithium Ion (LiFePO4) battery. Regenerative rear breaking. Sold in Canada and the US. Ask questions Join the 17 Motorino XMb discussion group or the general Motorino discussion group. 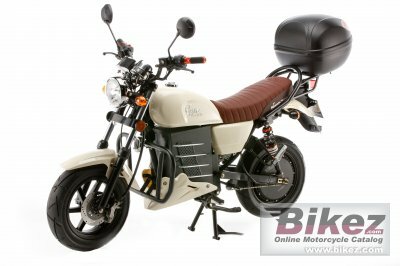 Get a list of related motorbikes before you buy this Motorino. Inspect technical data. Look at photos. Read the riders' comments at the bike's discussion group. And check out the moped's reliability, repair costs, etc. Show any 2017 Motorino XMb for sale on our Bikez.biz Motorcycle Classifieds. You can also sign up for e-mail notification when such mopeds are advertised in the future. And advertise your old MC for sale. Our efficient ads are free. You are also welcome to read and submit motorcycle reviews.